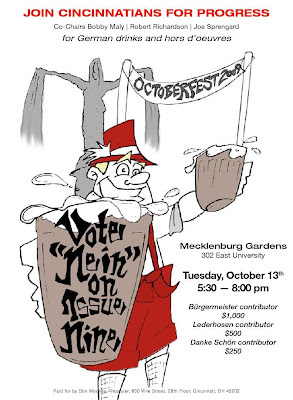 Cincinnatians for Progress (CFP) will be holding their final fundraiser of this campaign season on Tuesday, October 13 from 5:30pm to 8pm at Mecklenburg Gardens in Corryville. In addition to the food and drink, CFP will also unveil their television commercial and watch the Mayoral debate. Mecklenburg Gardens is one of Cincinnati’s oldest restaurants and boasts that German charm Cincinnati is so well known for. There will be plenty of Mecklenburg’s famous German food, plus some of the best beer in town. General admission is only $30 and will help keep Cincinnati moving forward with rail transportation choices for its residents, visitors and workers alike. For those looking to contribute a little more, CFP has identified three additional levels of contributors: Danke Schon ($250), Lederhosen ($500), and Burgermeister ($1,000). Mecklenburg Gardens (map) is just a hop, skip and a jump away from the proposed Uptown streetcar route and presently boasts nearby on-street parking for automobiles, bicycle racks, and is served by Metro’s #39, 46, 51, 75x and 78 bus routes that will all get you within a few blocks of the restaurant. To find out which route is most convenient for you, and to plan your trip now, use Metro’s Trip Planner.